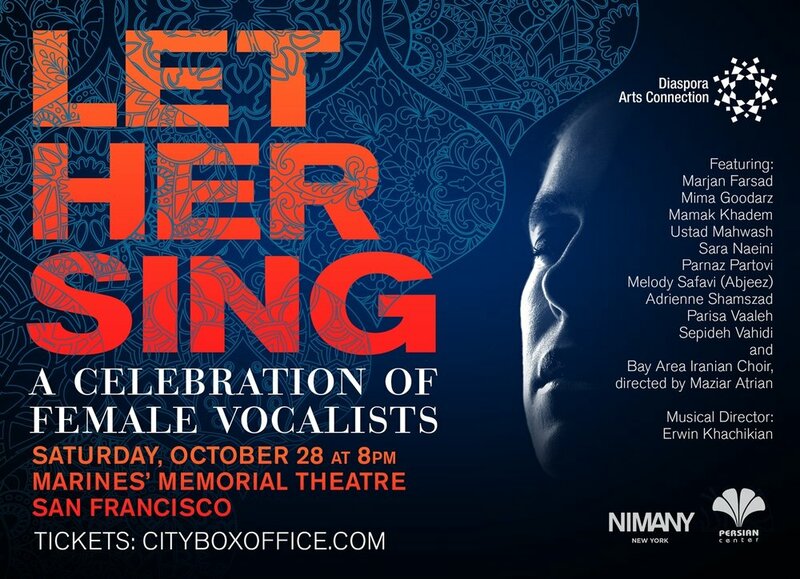 In the first rendition of Let Her Sing, DAC brought together artists from across the globe in presenting a spectacular showcase of female vocalists and musicians. In 2018 the lineup included Rana Farhan, Mahsa Vahdat, Marjan Farsad, Mima Goodarz, Mamak Khadem, Ustad Mahwash, Parisa Valeh, Adrienne Shamszad, Parnaz Partovi, and Sepideh Vahidi. The event’s musical direction was overseen by Erwin Khachikian, with Ana Bayat as MC. Artwork for this event was designed by Navid Ghaem Maghami. Read more about these wonderful musicians and check out our photo albums on Facebook below. Marjan Farsad: Born in 1983 in Tehran, Iran, Marjan Farsad is an animation filmmaker, illustrator, singer and songwriter. She studied Graphic Design in Iran and Film Animation in Montreal, Canada. In addition to her music career, she currently works as a designer and animator at BuzzFeed. Marjan's album, "Blue Flowers," was released in 2014, and the warm public reception of her songs has kept its momentum to date. Marjan Farsad will be embarking on her U.S. tour in December 2017. Mehrbanoo (Mima) Goodarz: Was born in Tehran, Iran. She started developing a passion for Classical Persian music at an early age. Encouraged by her supportive mother, she started her voice lessons with Master Mahmood Karimi at age 15 in Fravahar Youth Center. After Mr. Karimi’s passing, she continued her lessons with his protégé, Mrs. Afsaneh Rasaii. In 1988, she migrated to the US and had her first performance with Oshagh Ensemble in Los Angeles. She collaborated with Oshagh Ensemble for a few years until moving to the Bay Area in 1995. She started working with Mr. Mahmood Zoufonun and that’s when she met some of the members of Meehan Ensemble. Their first performance was in 2004. In 2009, she started working with Emad Bonakdar, a composer and guitar player with a specialty in Flamenco music. This was her first experience with fusion of traditional Persian and Western Music. In 2015, she reconnected with few of her old musician friends from Iran and together they formed Payvand Ensemble whom resides in Los Angles. Mehrbanou (Mima) is now an active member of Bay Area Choir of Northern California under direction of Mr. Maziar Atrian. This is her first performance with Mr. Atrian. She is always hoping to attract the younger generation to this beautiful music. Mamak Khadem: Called "...one of the wonders of world trance music", by The Los Angeles Times, Mamak Khadem captivates audiences by blending her roots in the ancient poetry and music of the Persian masters with a bold and revolutionary new sound. Formerly of the sensational cross-cultural fusion ensemble AXIOM OF CHOICE, Mamak weaves a canopy, both simple and rich, for a stunningly emotional and spiritual musical experience that inspires new listeners to embrace cultural diversity and an awareness and appreciation of Persian arts and culture through a blending of old and new. "The Road", Mamak's newest project, continues a journey started with her celebrated first solo album Jostojoo. Following her passion for new influences, Mamak has crossed borders from northern Iran to Serbia, Bulgaria, Macedonia, Morocco and Indonesia. Her search for common threads and powerful traditional melodies remains a driving force behind her music using elements from her Iranian heritage such as the poetry of Rumi to re-imagine a song from another culture, time and place. The freedom of her musical expression is intoxicating. Mamak has appeared throughout the Middle East, the US and Europe; performing at the Perth Concert Hall in Australia, the Greek Theater in Los Angeles, the Smithsonian Institute, the Museum of Folk Instruments and the Voices of Women Festival in Greece, Koln Philharmonic in Germany, the Irish World Academy of Music and Dance, House of Culture in Germany, California Plaza Grand Performances, the Skirball Cultural Center, and the Los Angeles County Museum of Art. She is featured on the soundtrack of the award winning documentary Skateistan and appears on the soundtracks of Peacemaker, Buffalo Soldier, Dark Angels, Traffic, Profiler, Dracula 2000, Persona Non Grata, Buffy the Vampire Slayer and Battlestar Galactica. Ustad Mahwash is the “Voice of Afghanistan,” and one of the most beloved singers in the entire Central Asian region. Her robust, luminous voice with its subtle command of ornamentation has dazzled audiences worldwide, as she shares her country’s rich musical heritage through performances and recordings. After the political turmoil of late 1970s and ‘80s, Ustad Mahwash was forced to leave Afghanistan. In 1991, she and her family moved to Pakistan, where she took refuge from two warring factions, each of whom wanted her to sing for their cause, or face assassination. Worn and exhausted, she applied for asylum abroad, and, eventually, Mahwash was granted political asylum in the United States in October, 1991. In 2001, Mahwash reunited with other exiled musicians to form and lead The Kabul Ensemble. Mahwash has built her phenomenal career in the face of two wars and under a forced state of isolation from her homeland. Although she had to leave Afghanistan, she has never lost her deep love for the country and its people. Sara Naeini (Saranin) was born in 1981 in Iran. As the first child of the talented Iranian traditional music singer Hourvash Khalili and her calligrapher father, she started singing when she was five. Sara's unique and uninhibited voice was discovered when she was 18, but as women are not allowed to perform solo singing in Iran, the limitations eventually forced her to leave Iran for the United States in 2012 in order to pursue her professional singing career. Performing in pop and jazz genres, Sara has collaborated with composers such as Reza Tajbakhsh and Reza Rohani, and has had numerous performances in California. In 2016, she began collaborating with Oceanic Blue and she is currently touring with them. Sara Naeini lives in Los Angeles and additionally works as a professional vocal instructor. Parnaz Partovi was born in Tehran, Iran. She has been playing violin since she was 10. She has performed at many regional concerts and won several awards at national competitions. Parnaz started her singing career in 2012 and released her first single, "Ghasedak" in collaboration with Morad Khojasteh Nejad that year. She composes the vocal and violin part of her songs and usually uses the poetry of well known Iranian poets. Parnaz's music is inspired with a mixture of Jazz and Blues. Adrienne Mehri Shamszad: Adrienne Shamszad is a singer-songwriter known for her special blend of folk, soul, blues and Eastern influenced improvisational vocals. Her lyrics are poetic, intimate, genuine and inspired by the mystic Poets of Iran as much as the folk poet-songwriters of the 60s and 70s. Her strong and soulful voice, skillful and complex guitar work and bold performance style have made her a popular California performer for well over a decade. Adrienne is an Oakland, California native of Persian heritage who has traveled extensively, studying theater, music and dance throughout Asia, India and the Middle East. Her mission is clear: to weave together the threads of her study and creativity into an original musical fabric that moves and inspires her audiences. Her impressive musical range extends from the sacred to the profane, the mystical to the earthy, the lofty to the down-low, and she is equally at home with acoustic or electric, improvisation, singing gospel, Indian mantras, rock and roll, rhythm and blues and Persian classics. Her debut album, A New Life, was released in 2008 and recorded at Seclusion Hill Records in New Jersey. The mix of folk, jazz and pop tied together by Adrienne's influences of Blues, Persian, Indian-Classical and Americana has made "A New Life" a musical-companion for fans throughout the States, India and the Middle East. Adrienne continues to collaborate with various performers. Parisa Vaaleh: Parisa Vaaleh was born in an art loving family in Tehran. Parisa's attraction to the common bond between the people of all nations regardless of race or creed led her to fusion music. In 1995 she recorded a song composed by “Peyman Abdali” and entered it to a competition held by the “XDot25 Music Production Company”. The song was one of many recorded in an album by the name of “Nevag”. Result of this recording put the song at number one spot. Parisa worked with “Henrik Naji”, “Reza Abaei”, and “Aldoush Alpanian” in 2007 in an album by the name of “Ascent”. In 2010 performed and recorded the unforgettable song “Ma Ra Beboos” with a new arrangement by “ Kamran Thunder”. Also this union resulted in the recording of a new song “Bahar-e ghamangiz” with the lyrics from a poem by “ Hooshang Ebtehanj” and a melody by Parisa herself. Her second album with the title of “Fasl e Entezar” with collaboration of “Siavash” and creation of some of the best Iranian musicians was released in summer of 2010. Parisa continues to collaborate and perform with various US-based artists. Sepideh Vahidi Music Page: Born in Tehran, Iran, Sepideh studied Persian folklore and traditional Persian music under some of the finest masters of this art. Weaving the transparent layers of many emotions into a sound that could not be defined by the name of a land with borders became her tradition. However Sepideh’s vocals have deep roots in her Iranian identity, femininity, and very much influenced by Persian poetry. Living in America, Sepideh studied Fine Arts, once again using layers as her primary tool. Both in her vocals and her artworks, she folds and unfolds, twist and turns notes to express the happiness, pain, love, grief, hope, nostalgia, and memories that haunt her in life. Sign up below to receive DAC’s newsletters containing the latest news and events!